Steve Tarvin was born, raised and currently resides in Chickamauga, Georgia. He attended Gordon Lee High School, and later began working at Crystal Springs, a textile mill in Chickamauga, on January 13th, 1970. Starting at minimum wage, Steve worked his way up through the company, and served 31 years as President and CEO of the 750,000 square foot plant that specialized in the commission bleaching, dying, printing, and finishing of textiles. Steve is particularly passionate about their work on protecting our troops with Defender M™ flame retardant camouflage fabric, involvement in helping his friend Toxey Haas of MossyOak start into the hunting camo business and their work in the spring of 2013 with Bill Jordan and the RealTree staff on their new Max5 camo soon to be seen on Duck Dynasty. Steve has offered himself to his community as the President of the local Habitat for Humanity and as President of the local High School Athletic booster club. During the summer of 2009, Steve raised money for and oversaw the construction of two new ball fields in his community. Steve is a past Secretary of the Executive Board of Shorter College, and also a past Board member of the American Gelbvieh Cattle Association in Westminster, CO .
Steve’s values come from his Christian faith and 44 years of life experience as a husband, father, laborer and business owner/manager. Steve married the former Jennifer Lance on January 1, 1970, they are the proud parents of two children and six grandchildren. Steve and Jennifer are members of Oakwood Baptist Church. Steve’s life is defined by family, hard work, and providing both jobs for the people of north Georgia and protection for our troops in combat. Steve will bring a fresh perspective to Atlanta with decades of common sense business experience and the family values that make north Georgia a wonderful place to live. 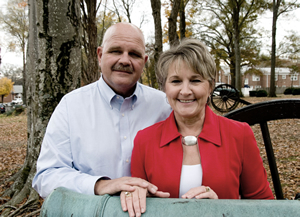 Steve and Jennifer started their retirement on March 14, 2014 and plan to serve the people of Northwest Georgia on a full-time basis.